The coordinated attack on Syria by U.S. and allied military forces illustrates the conflicting impulses behind President Trump’s foreign policy. He remains an “America First” isolationist who disdains a role as global policeman. But Trump is also a determined counter-puncher who can be moved to action by grisly pictures he sees on TV. For the second time in just over a year, Trump ordered airstrikes on Syrian targets in retaliation for a suspected chemical weapons attack by Syrian President Bashar Assad. Just ten days before launching the retaliatory strike, Trump had stressed his impatience to bring U.S. troops home from Syria, where they’ve been battling ISIS. Both the president and his military advisers took pains to say the attack on Assad’s chemical weapons facilities was not a prelude to a wider war. Earlier this month, Trump hinted that day could come quickly. “I want to get out. I want to bring our troops back home,” Trump said during a White House news conference April 3. He argued that the money the U.S. has spent since 2001 fighting in Afghanistan and Iraq has been largely wasted. That echoed comments Trump made during the campaign when he argued that the U.S. had overextended itself militarily around the world. Once again, though, Assad’s suspected use of chemical weapons prompted the president to play cop on the beat, however reluctantly. “It’s too bad that the world puts us in a position like that,” the president said Thursday during a meeting with farm-state politicians. Unlike the attack a year ago, in which American forces unilaterally fired cruise missiles at Syria, this latest assault was carried out in cooperation with U.S. allies France and Britain. “Thank you to France and the United Kingdom for their wisdom and the power of their fine Military. Could not have had a better result,” Trump tweeted Saturday. 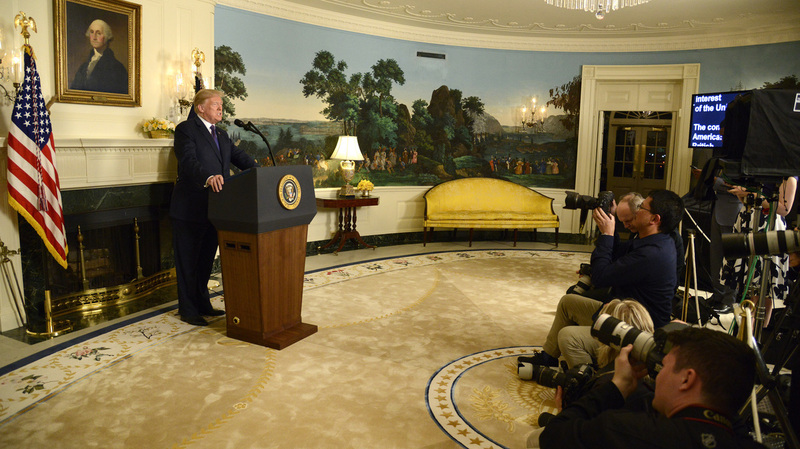 Although the president said the U.S. and its allies are prepared to sustain their campaign against Assad’s chemical weapons facilities if necessary, he suggested that military action is finished, for now. “Mission Accomplished!” Trump also tweeted. The president consulted frequently with U.K. Prime Minister Theresa May and French President Emmanuel Macron in the days leading up to the attack. Coordination with those allies is one reason the strike took longer to organize than last year’s. Trump also discussed the Syrian situation with Turkish President Recep Tayyip Erdogan and the Emir of Qatar, Tamim Bin Hamad Al Thani. The presence of Turkish and Russian troops in Syria along with local forces and the remnants of ISIS adds to the complexity of the landscape. Trump has often spoken of his desire to build a stronger relationship with Russia, but Moscow’s support for Assad poses another impediment to that. Trump also stressed that his suspicion of U.S entanglements in the region has not changed since the campaign.